CAT CHASE THE MOON. By Shirley Rousseau Murphy. William Morrow. 288 pages. $24.99. Those who love both cats and mystery novels know there is a whole genre of mysteries involving cat sleuths. Years ago I had the privilege of interviewing Lilian Jackson Braun, whose “Cat Who…” mysteries featured a very smart cat with a sixth sense who had various ways of pointing his less-perceptive human in the right direction. I had an enjoyable visit with her at her home in the North Carolina mountains. I’ve also enjoyed the books of Rita Mae Brown, with cats and dogs that talk to one another so that readers can understand them, but who don’t actually talk to the humans in the books. 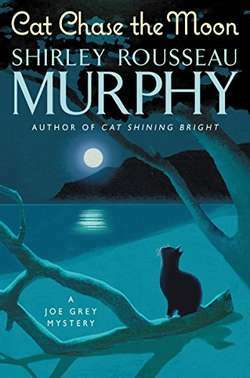 Now I’ve read my first Joe Grey mystery by Shirley Rousseau Murphy, one of the contemporary stars of cat fiction, having won the Cat Writers’ Association Award for best novel of the year 10 times. And to think I didn’t even knew there was such an association or award. Joe Grey and some of the cats closest to him can actually talk to select humans, when they so choose. Joe Grey can even use the phone and call in tips to the local police. Joe Grey is a cat detective who lives in Molena Point, a fictional town on the California coast south of San Francisco. He has a partner, Dulcie, and they have young-adult kittens. As the book opens, Joe Grey finds a badly beaten woman lying near the beach and makes sure the police find out so that they can rescue her. Normally, Joe would be investigating who attacked this woman and why, and he’d be looking into the suspicious, quarrelsome new family in town, along with other suspicious people and happenings. But Joe and Dulcie, the town library’s cat, are too preoccupied with worries about their daughter, Courtney, who’s gone missing. They enlist the help of all their friends, feline and human, to look for the lovely but headstrong calico. Courtney, meanwhile, is being pampered in an apartment above an antiques shop, torn between wanting to escape and being flattered by the big plans her kidnapers seem to have for her. As the police are struggling without his usual help, and as he begins to think that the various mysterious happenings and crimes in town might all be connected somehow, Joe Grey knows he must get back to his detecting ways. Joe Grey, Dulcie and the other cats are interesting, especially as they carefully navigate in the human world without revealing too much about their special talents. They are endearing, as they care about their own loved ones and about others, humans as well as cats, who might need help or affection. And there’s enough to the mystery – or, in this case, multiple mysteries – to engage the reader. As usual with “cozy” mysteries, the people (and cats) in the town provide a good bit of the entertainment. This is good, light reading to please the many people who enjoy both mysteries and cats. For me, it was a welcome break from some nonfiction and heavier fiction I’ve been reading lately. My main problem with Cat Chase the Moon was that it’s No. 21 in a series, and I haven’t read the first 20. I had a little trouble keeping all the recurring characters straight, and I don’t think I know all I’m supposed to about these cats’ special abilities and histories. The solution to my problem, however, is easy enough and promises to be not at all unpleasant. I just need to find the earlier Joe Grey books and start reading. This entry was posted in Cat mysteries, Mysteries and tagged cat mysteries, Joe Grey, Shirley Rousseau Murphy. Bookmark the permalink.